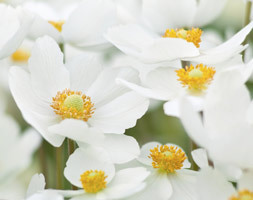 A lovely little anemone which forms a mound of deeply cut foliage, topped with nodding white flowers with yellow centres in late spring. The plant gets its common name from the way the flower buds emerge on bent stems, so they hang like snowdrops. Then they straighten up and face outwards as the flowers start to open. The petals catch the breeze, making them look a little like butterflies, and they will grow to form open cup shapes up to 7cm across. They are scented and are good for cutting, but if you leave them on, they will be followed by white woolly seedheads. Find the right spot for them and they will naturalise and spread into large clumps.